Do you wanted to visit the office of one of the world largest player in GeoIT? 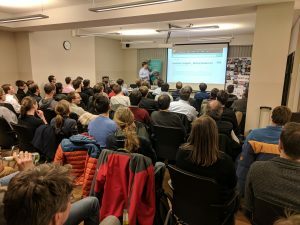 This is a good opportunity to get to know the environment of our GeoIT.org member via the next upcoming 17th GeoIT Geomonday Talk event on March 19th at 19h, Berlin, Invalidenstraße. After a short opening by Prof. Dr. Roland Wagner as GeoIT.org president and by Manuel Friedrich as partner, we will have four talks. 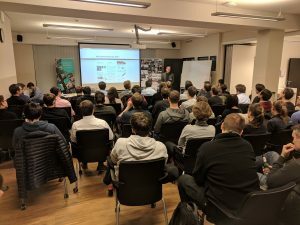 HERE’s developer evangelist Dr. Richard Süselbeck will give a host talk about Electronic Horizon (maps as a sensor) and multimodal APIs. 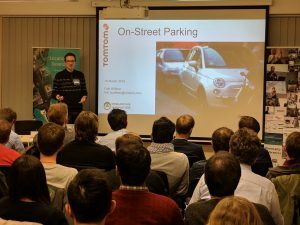 TomTom’s research and development team member Dr. Falk Hüffner will continue about the open parking challenges. 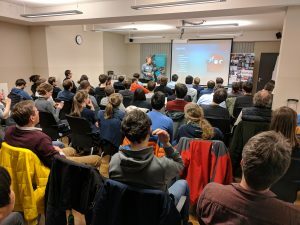 Thomas Mönkemeier, aka moenk, will talk about his mapillary_tools, which here created and published to refine the tool chain. The need resulted from an HU Project. 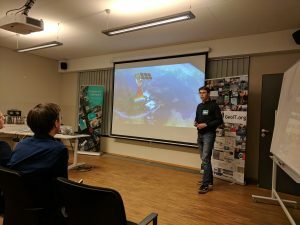 Sven Przywarra, Co-founder Live-EO, will talk about its startup and live earth observations with drones. There will be also an open discussion – if time is still available- about an idea to number exists like Tokyo’s underground systematically. This idea was initiated at the DB Mindbox Hackathon with Japan Rail East and mentioned at the last wherecamp. … joined us at HERE. 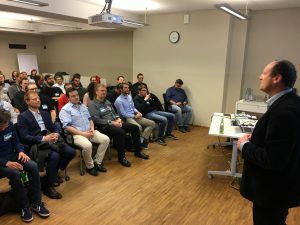 Also the GeoIT original Christof Helmis, vice president of HERE, joined this evening (See GeoIT Wherecamp 2015 opening ).